Authored by: Joseph Panno, Ph.D. Attempts to understand the aging process have generated a great number of theories but few practical therapies. Traditional therapies treat age-related diseases such as cancer and arthritis but do not reverse the aging process itself. A common trend in gerontology is to search for genes that have a demonstrable effect on lifespan, the so-called longevity genes. Many such genes have been identified, and although the manipulation of these genes does not stop the aging process, they provide many valuable insights into the cellular mechanisms of aging. More recently, interest has turned to the use of cloning technology, stem cell analysis, and genetic manipulation in order to produce an effective rejuvenation therapy for cells and the body as a whole. 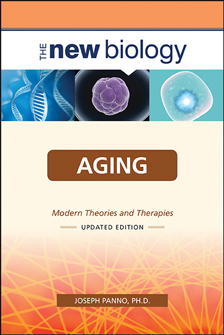 Aging, Updated Edition describes the field of gerontology and the many theories that scientists have developed over the years to explain the age-related changes that occur in nearly all animals. This eBook, which comes complete with full-color photographs and line drawings, has been extensively revised and expanded and features three chapters on aging. Coverage includes practical insight on the ways in which humans age, how the aging process has changed over the past thousand years, theoretical aspects of rejuvenation, and exciting studies and effective treatments for Alzheimer's, cardiovascular disease, and osteoporosis. Joseph Panno, Ph.D., holds a degree in biology from Simon Fraser University in British Columbia and specializes in molecular biology and physiology. He has taught undergraduate biology courses and has published in numerous peer-reviewed publications, including Cytometry, Mechanisms of Ageing and Development, and Molecular Brain Research.